Community music podcast – turn up the volume!!! Dave has been in the audio industry in many forms for many years having been involved in the production of shows for hospital radio. His father also ran a famous audio/visual studio in Woking, Surrey for a number of years, so the industry is very much in Dave’s veins. He started The Bugcast, initially on his own, in March 2008 to prove that he could do it after being inspired by a couple of friends who were also podcasting at the time. He is now involved with a number of other podcasts in the music and technical arenas, and is also testing the waters as a voice artist. When Dave isn’t podcasting, he’s a musician and web developer as well as being employed full-time as a database administrator and developer. In this episode of CCJam, Yannick presents two tracks from the Russian band Snowed Under. Formed in 2009, the band plays a mixture of pop-oriented funk and rough garage rock. They have two EPs available on Jamendo, but Yannick couldn’t find any presence on the internet. 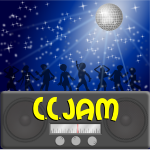 In episode 57 of CCJam, Yannick features the music of Swedish house music duo Axl & Arth. They formed in the spring of 2015, getting their inspiration from old rock and modern day pop and house music. They have been working on an album that was to be published in late 2016, but unfortunately, they seem to have disappeared from the surface of the planet just before the release. Find more of Axl & Arth’s music on their website which actually sends you to their soundcloud page. In episode 56 of CCJam, Dave features the music of UK rock band Aphemia. They are from Derby here in the UK, with an industrial/electronic, progressive rock sound, combining influences such as Nine Inch Nails, Celldweller, Disturbed and Muse. They recently released their latest EP “Terminus”. You can download Aphemia’s music from Spotify, Google Play, Bandcamp, Amazon, and pretty much anywhere else you can buy and download music. Please note: although the music of Aphemia is not released under a Creative Commons (or other free culture) licence, the band has given their explicit permission for their music to be featured on this episode of CCJam. Many thanks to the band. CCJam 54 – Scream Inc. In episode 54 of CCJam, Yannick features the music of Ukrainian hard rock band Scream Inc.. They are a hard rock band, who began as a Metallica tribute band, back in 2008. Since 2015, they started playing their own stuff, and they now have five singles, all present on an EP called Inception, which was released on Jamendo in April this year. Find more about Scream Inc. on their website or their Facebook page. Author Dave LeePosted on 24th August 2017 24th August 2017 Categories CCJam1 Comment on CCJam 54 – Scream Inc. In episode 53 of CCJam, Dave brings you the music of ProleteR, a French producer and beatmaker, combining heavy hip-hop beats and jazz/charleston samples, spiced with guitar arrangements and smooth pieces of synth. You can find the music of ProleteR over at Bandcamp, Spotify, Google Play, Amazon, and pretty much anywhere else you can buy and download music. In episode 52 of CCJam, Caroline brings you the music of Mercury and The Architects, a cinematic music experience from Staten Island in New York. You can find the music of Mercury & the Architects over at Jamendo, ReverbNation, Free Music Archive, SoundCloud, and also from their official website where you can “Enter The Maze” for the change to get other digital content! In episode 51 of CCJam, Yannick introduces the listeners to Russian band Somewhere In Time. Not a lot of information about the band, even on their VK.com page, but there is a tiny piece of info about their first album Catharsis on their bandcamp page : it’s a concept album, divided in three parts, inspired by Dante’s Divine Comedy. The album is also available from Jamendo and YouTube. In episode 49 of CCJam, Yannick brings you the music of Moonshiners, a French rock band from Normandy. They can be found on Facebook and their album Distillé is available on Jamendo, iTunes, Amazon, and probably a lot of other places! In episode 48 of CCJam, Dave brings you the music of Boogie Belgique, a Belgian band with a sound that can best be described as a fusion of old and new, vintage yet innovative. You can find the music of Boogie Belgique over at Bandcamp, Google Play, Amazon, and pretty much anywhere else you can buy and download music. the bugcast 476 - It's your birthday...day...day - The Bugcast on CCJam 54 – Scream Inc.